This is using Trixbox as a web scheduled conference bridge for your Cisco Callmanager. As most of you CCM guys know, CCM comes with a light meet-me conference bridge; you can’t password protect in any way and there are few features. If you want to run the Callmanager conference server, you are looking at somewhere between $8K-10K. I got all of the functionality I wanted for $0! We wanted to have the ability to schedule through the web, when users call in they enter a conference #, then the users have to enter a Pin number…simple, right? This is done with an install of Trixbox CE 2.6.2.3 (Stable) found here. Trixbox, as you all know, is a bootable ISO that installs centos and a complete working install of asterisk and FreePBX GUI. I love it! I didn’t even burn a server to install this on, I just loaded it up on one of our VMWare servers, so we really are spending no money on the project. Here are the config steps I took once trixbox was installed and IPd. Selected the Tools tab and clicked Module Admin (which is actually available in both the Tools and Setup tabs. Scrolled to the bottom of the window and clicked the “Process” button. Be sure to apply changes. I didn’t want my Trixbox to be able to dial out, so I didn’t add any outgoing route patterns, but you do need to configure incoming route patterns. If you leave any DID information blank, it will capture ANY incoming call and force it into the conference bridge, which is what I wanted. I also wanted to lock down my admin pages so that only my subnet can hit the admin pages, but my entire organization can hit the web-meet me. You will also want to update the allow list for your existing maint and admin dirs. The above was stolen from this link and kludged together from random others. To get the SIP trunk from callmanager I followed the directions listed here. I’m just posting the link, since this is all in one page. Once done, route one of your DIDs from callmanager to the sip trunk. There is a typo in one of the .php files for Web Meetme. Search for ‘userPassr’ and change ‘userPassr’ to ‘userPass’ (removing the ‘r’ on the end). The fix is listed here. I also did some tweaking to the php code. There is a limitation on the number of recurring days you can set daily and weekly meetings for. I wanted to be able to schedule these things out for years! By default you can only set daily for 14 days and you can only set weekly for 26 weeks…I modified it a bit This will give you 3 years of dailys and 30 years of weekly…hehe. defines.php also has some of the default values for the notification emails. In closing, I would recommend you guys install webmin for easier system administration. In webmin, I would set the server to sync with an NTP time server, that way your conference scheduling is accurate! You should now be able to see most of what’s happening in call control. Elastix is an opensource PBX much like trixbox, but appears to be actively developed unlike the CE version of trixbox, which is dead. Anyway, the configuration is close, but you need to make a couple of modifications. BTW, elastix has a much prettier interface! Hit the drop down and choose security. 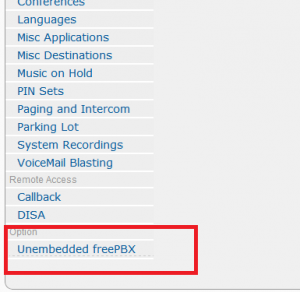 Turn on direct access to freePBX. 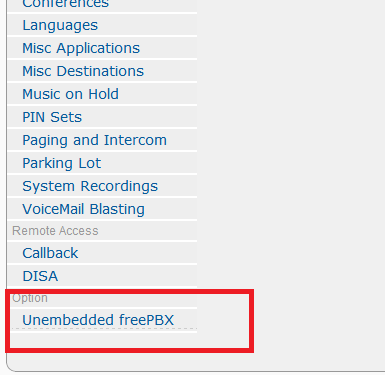 In the PBX section at the bottom click unembedded freePBX. Restart your asterisk services and you should be rocking and rolling! Elastix has fine grained control for conferencing. You can basically lock it down so users only see the conference section when they log in. System – users – groups. Add a new group called conference. Group permissions. Hit the filter section, choose conference and filter for conference. Check the conference permission and save. 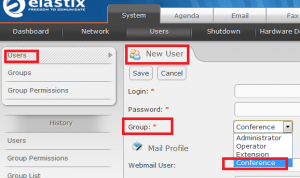 Create a new user and under group choose conference. Now the only thing they can see is conferencing! Once you get this all setup and you add a conference, you dial in. You are prompted to type the conference #, and if you specified a Pin, it will ask you for it. Then you are joined to the bridge. If you use the announce check box, it prompts you to record your name and you are announced when you enter and leave the room. I hope you find this useful, because I think it’s frickin cool. It is going to save us somewhere around $500 a month! Let me know what you guys think in the comments. Also as I make adjustments, I’ll add them to this page. What type of capacities can you expect to get out of this, and what resources did you give your guest VM? What is the largest number of users you have had in one conference, any voice quality issues since you didn’t have hardware DSPs or hardware timing sources? I’m not sure what capacities one can expect. I’ve given the VM a couple of CPUs and 1GB of RAM. The largest number of participants was probably somewhere around 8. The only issues I’ve experienced is stability issues. This version of trixbox isn’t the most stable thing out there, so I have a cron that occasionally kicks the server. I didn’t integrate it with AD. 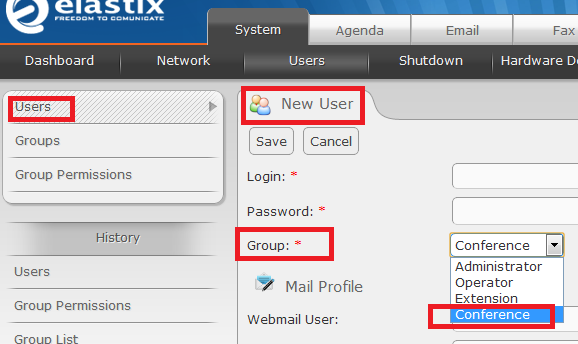 You can set some users as admins, so only they can adjust pins and such.